"Teto is a combination (of a character and a voicebank)"
というわけで、"Kasane Teto is a △△" について考えてみませんか? >"Kasane Teto is a △△" について考えてみませんか? "Kasane Teto is a virtual singer"
kasane teto is a fake diva. Kasane Teto is an Internet diva born from fake. >というわけで、"Kasane Teto is a △△" について考えてみませんか? 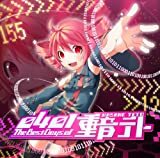 "Kasane Teto is a character"
Kasane Teto is an Internet character born on April Fool's Day, 2008. She was just a fake VOCALOID at first, but soon acquired her own synthesized voice to sing, many character images and so on. She is singing, appearing and acting on many Internet creations attracting more and more creators and audiences today. >Kasane Teto is an Internet character born on April Fool's Day, 2008. >She was just a fake VOCALOID at first, but soon acquired her own synthesized voice to sing, many character images and so on. >She is singing, appearing and acting on many Internet creations attracting more and more creators and audiences today. "soon acquired 〜many character images and so on"
"just"しかり"at first"しかり"many character images and so on." "kasane teto was fake diva"
Kasane Teto is a character originally created as a fake "Vocaloid." Following the rising popularity of Hatsune Miku, which was released in August 2007, vip@2ch users collectively planned the troll "new Vocaloid release" for the April Fool's day of 2008. Fake demos were posted on Nicovideo, Sen providing the illustration, and Mayo Oyamano the voice. After the troll, Mayo's voice was recorded for the fanmade voice synthesis program UTAU, which was released just before a month. Soon many composers started to create songs using this newcomer, and Teto established popularity both on Nicovideo and YouTube. Kasane Teto is not a "fake" diva any longer. The popularity led to 3D models, figurines and many illustrations by fans. Furthermore, the regular update of the voicebank and UTAU platform has made Teto one of the most famous counterparts to Vocaloid characters. Thank you very much for all your comments and subscriptions! Teto is happy having so many friends around the world. Teto is preparing to answer your questions and requests in English. 175： 名無しさん ：2010/08/08(日) 00:47:42 ID:??? Kasane Teto is a character, which was created as a fake "Vocaloid" initially. Following the rising popularity of Hatsune Miku, which was released in August 2007, vip@2ch users collectively planned the troll "new Vocaloid release" for the April Fool's day of 2008, and fake demos were posted on Nicovideo. The illustration was created by Sen and the songs were sung by Mayo Oyamano. After the troll, Mayo's voice was recorded for the vocal synthesis program Vocal Synthesizer Tool UTAU, which was developed by Ameya/Ayame. Soon many professional and amateur musicians started to compose songs using this newcomer, and Teto established popularity both on Nicovideo and YouTube. Kasane Teto is not a fake diva any longer. The popularity led to 3D models, figurines and many illustrations by fans. Furthermore, the regular updating of the voicebank and UTAU platform has made Teto one of the comparable characters to Vocaloids. > which was created as a fake "Vocaloid" initially. ところで "Vocal Synthesizer Tool UTAU" という名称は「歌声合成ツールUTAU」の公式な英訳なんでしょうか? > Furthermore, the regular updating of the voicebank and UTAU platform has made Teto one of the comparable characters to Vocaloids. Kasane Teto is a 2ch-born character, who was created as a fake "Vocaloid" initially. Following the rising popularity of Hatsune Miku, vip@2ch users collectively planned the troll "new Vocaloid release" for the April Fool's day of 2008, and fake demos were posted on Nicovideo. The illustration was created by Sen and the songs were sung by Mayo Oyamano. After the troll, Mayo's voice was recorded for Vocal synthesis tool UTAU, which was personally developed by Ameya/Ayame. Soon many professional and amateur musicians started to compose songs for this newcomer, and Teto established popularity both on Nicovideo and YouTube. ◯"Soon many professional and amateur musicians started to compose songs"
"The popularity led to 3D models, figurines and many illustrations by fans." 200： ようつべ支店担当 ：2010/09/30(木) 22:19:29 ID:JfgPuoL. 201： ようつべ支店担当 ：2010/09/30(木) 22:26:31 ID:JfgPuoL. 203： あーさん ：2010/10/17(日) 21:53:31 ID:JfgPuoL. 204： ようつべ支店担当 ：2010/10/17(日) 21:54:42 ID:JfgPuoL. 205： ようつべ支店担当 ：2010/10/17(日) 21:59:16 ID:JfgPuoL. 206： ようつべ支店担当 ：2010/10/22(金) 00:44:03 ID:JfgPuoL. 209： ようつべ支店担当 ：2011/01/29(土) 14:02:44 ID:JfgPuoL. 211： ようつべ支店担当 ：2011/03/09(水) 23:04:34 ID:4eVrVZy. 212： ようつべ支店担当 ：2011/03/25(金) 22:42:30 ID:4eVrVZy. 213： ようつべ支店担当 ：2011/04/16(土) 00:28:50 ID:4eVrVZy. 214： ようつべ支店担当 ：2011/05/05(木) 17:13:52 ID:4eVrVZy.